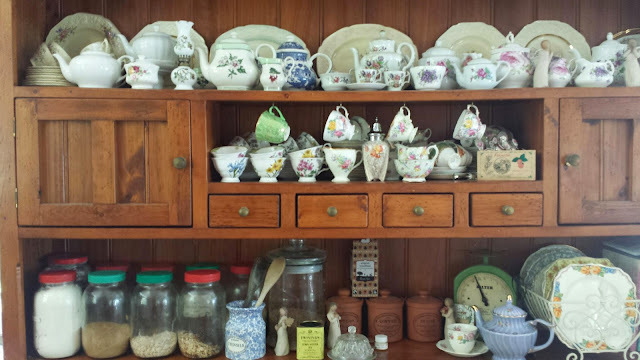 Today I am sharing some pictures of my country kitchen. I have written about my kitchen before but I have spent some time recently rearranging how things are set out to make it more user friendly for my twin girls who love to bake. I now am the proud owner of 3 dressers or as you may call them, hutches. The one in my kitchen is the largest and most solid. 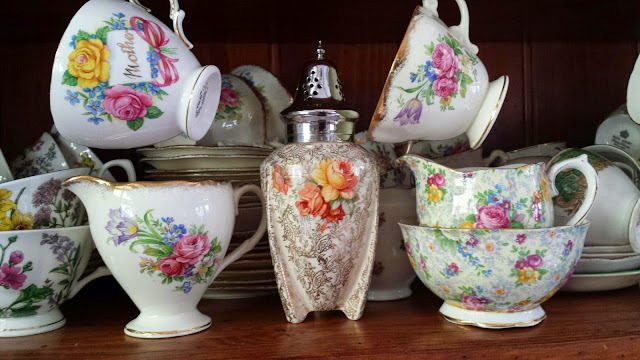 It holds most of my vintage china with its large spacious cupboards where I store dinner and entree plates, dessert bowls, trios and some dinner sets. 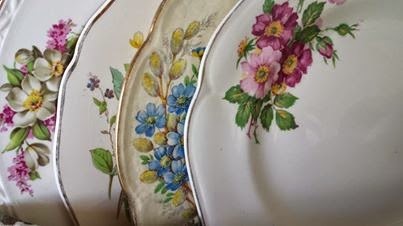 As you can see from just peeking inside my cupboards, I have a big collection of English china. The little salt/sugar shaker is the latest addition to my collection. I can't resist anything with roses! Does the china get used you may ask? Absolutely! I have a vintage hire and styling business and the china has graced tables at bridal and baby showers, a Jane Austen themed Regency ball for a 21st birthday party and of course weddings! It has been on trips to country halls, private homes and 4 1/2 star hotels. Setting beautiful tables is a passion of mine and it's lovely to have something which can earn us some additional income from time to time. It also means I have more than ample hospitality supplies. No need to use paper plates or plastic forks. And of course should you ever visit me at home you can choose a teacup (over 200 to choose from!) and we will enjoy tea and fellowship together. This dresser has drawers with inbuilt compartments perfect for my cutlery sets. 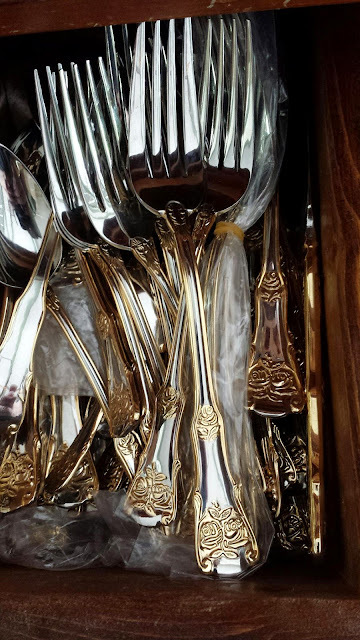 This is the cutlery I use on special occasions and hire out for wedding receptions. I have silver plated place settings and a beautiful Royal Albert setting with gold plated accents that has been used for bridal tables. 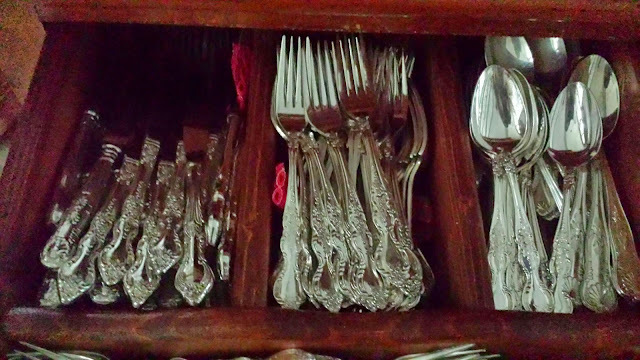 I recently purchased a set of Laguiole cutlery with pearl coloured handles which teams perfectly with my vintage plates as most of them have cream backgrounds. I just love their floral embellishments and scalloped edges. I recently moved my larger glass jars of ingredients and baking essentials down from my cooks shelf to the dresser. Previously, my girls were forever asking me to get down the jars for them. Now they can easily access them and it saves me a lot of time! They are only 8 but have mastered a number of our favourite recipes. They are completely independent and I only help with removing larger trays from the oven for reasons of safety. Here's a few recent cakes they baked. They substituted mulberries for plums in this Annabel Langbein recipe. It is one of my favourite cakes. 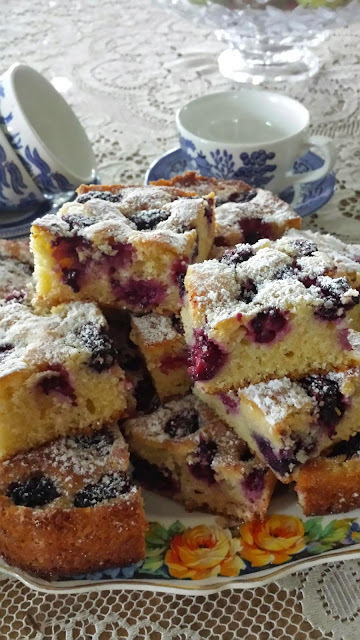 The other is 'Dorothy's Rhubarb cake'.. one of the first recipes I tried from a blog. The blogger shared her neighbour's recipe. 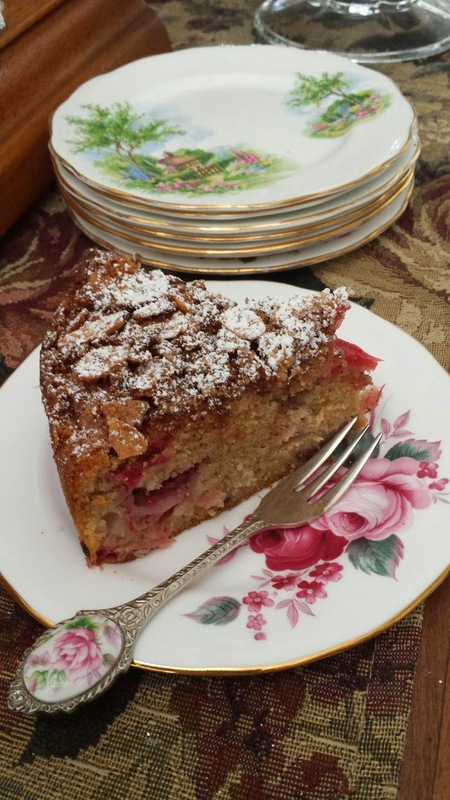 I am sure Dorothy never realized her rhubarb cake recipe would become a family favourite in a home in Australia! There's a link to it on my 'slice of heaven' pinterest board if you want to try it. I love my cook books almost as much as I love my china and moved most of them up to my cook's shelf from the dresser. I love having everything accessible for cooking and it saves me so much time not having to rummage around in cupboards or drawers. My kitchen is by no means perfect. It has some dream elements such as an Ilve stove but it has limited bench space, a too small, narrow pantry and there is nowhere to house our large side by side fridge freezer which sits in the corner of our dining room for now. I am happy to live and work with the current arrangement. I have never forgotten our first missions trip and our visit to a slum area in Jakarta, Indonesia many years ago where the open sewer ran past the front of the ramshackle house and seeing the tiny stove in the corner of a room with its dirt floor where the wife cooked meals for her family and guests. The size of her kitchen and it's lack of facilities made no difference to the quality of her cooking or the warmth of her hospitality. It was a real lesson about learning to be content and I thought of my own dissatisfaction with the dated but spacious kitchen in our first home with its dark timber laminate cupboards and orange bench tops. What was I really complaining about! And so I accept and work around my kitchen's limitations and thank the Lord for giving me such a lovely kitchen in my country home and providing what we needed for it at the right time at the right price. It's where I bake bread and make meals for my family, where my children have been taught and still are learning to cook and it's the first room our guests step into. Most of them gravitate to it anyway and it's homely furnishings and the aroma it produces sometimes makes them want to stay longer .. a lunch invitation often extends to dinner in this home and it's something I have learned to expect and prepare for. 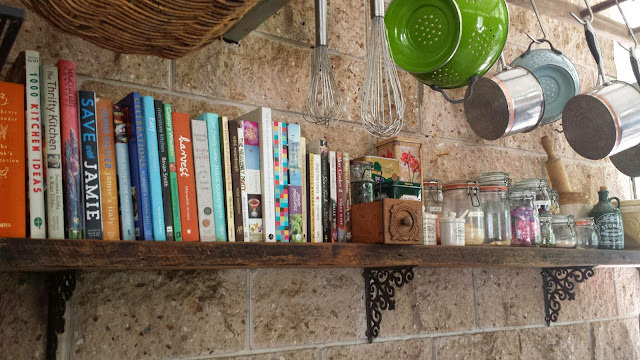 I hope you have enjoyed seeing the pictures of my country kitchen. As Jane Austen famously wrote 'There is nothing like staying home for real comfort' and as for me.... my kitchen provides much of that comfort! I love seeing some of the pictures of your kitchen. I have often imagined it, and what a treat to see it. Love that dresser. It is perfect. 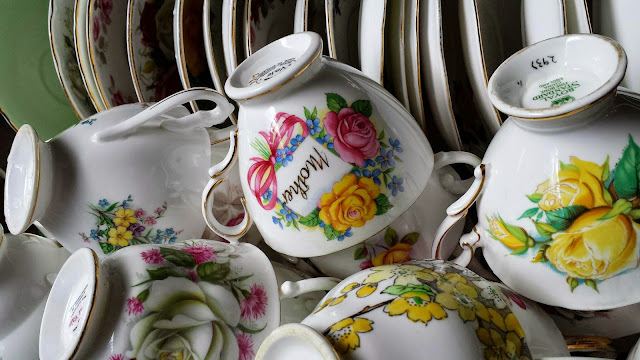 The china, teapots, salt and pepper and silverware are all so lovely. I think part of the enjoyment of homemaking, is creating beauty, and comfort with what you have, and to have the pleasure of searching for the perfect additions, to complete what you have; it is like being on a treasure hunt. You match your business wonderfully, because you are a wonderful example of hospitality. Oh I LOVE your china. Looks absolutely gorgeous~!! Now while I actually do own some fine china, my kitchenette ended up with books in it though.